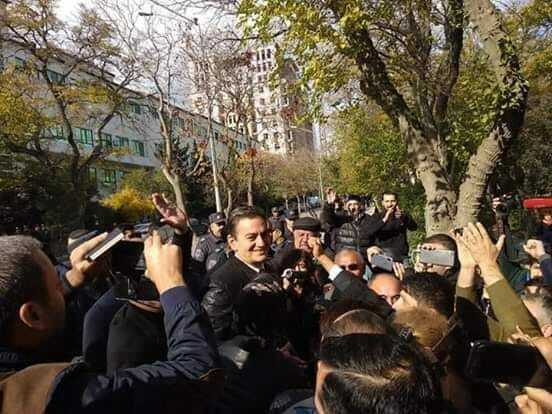 Dozens of Azerbaijani political opposition members, including a party leader, were detained as they took part in a holiday commemoration that the authorities said was an unsanctioned political action. Ali Karimli, chairman of the Popular Front Party (PFP) of Azerbaijan, was arrested on November 17 as he was marching together with about 150 other party members towards Baku’s Alley of Martyrs, a cemetery for war heroes. The occasion was Azerbaijan’s National Revival Day, which marks the anniversary of the first large-scale nationalist protests against Soviet power in Azerbaijan in 1988. In a statement issued the day after the arrests, the Baku City Police said that, in spite of being warned, the PFP carried out the march for “political purposes." As a result, 52 participants were detained; 41 of those were released the same day but 11, including Karimli, were arrested. Two days later, Karimli was charged with a 2,500-manat (about $1,500) fine and released. Karimli’s lawyer, Fuad Aghayev, said the charge was holding an unsanctioned march. "No one has the right to prohibit citizens from remembering heroes and we do not recognize such a ban and will visit the Alley of Martyrs when we consider it necessary," Karimli told a crowd of supporters after his release. Three others were given 20-day administrative arrests, and seven were given fines of between 400 and 500 manats, PFP officials told the news website Caucasian Knot. The events mirrored another police crackdown earlier this year: After a celebration in May of the 100th anniversary of the founding of the Azerbaijan Democratic Republic that was put on by some leading members of the political opposition, police arrested a number of the organizers. Ali Hasanov, an aide to President Ilham Aliyev, blamed media for “spread[ing] unchecked, biased and one-sided information” about the arrests. “This has nothing to do with the violation of human rights and freedoms. It is maintenance of public order, not the issue of political affiliation which is the main criterion for police,” he told the news agency Azertac. “Despite being members of a political party, their visits were not a political action, and they visited martyrs on the occasion of National Revival Day,” wrote activist Bakhtiyar Hajiyev on his Facebook page, where he also posted a video of the detentions taking place. “All political parties, citizens, and civil society activists have to condemn this ban,” he said, calling on them also to visit the Alley of Martyrs. Elmar Məmmədyarovun Azərbaycan dilində danışa bilməmə videosu təkcə mənim səhifəmdə 3000 dəfədən çox paylaşılmışdı. Bu görüntülər ondan da böyük ayıbdır. Təkcə gülməli vinerlərin, məmurların gülməli videoları paylaşılmalı deyil ki? Şəxsən mən bu görüntülərə baxanda utandım. Bir qrup Azərbaycan vətəndaşı Şəhidlər Xiyabanına getmək istəyir, bir qrup polis isə sinəsini qabağa verib, canları ilə qadın, qız, xəstə, yaşlı, uşaq demədən onların qarşısını var gücü ilə almağa çalışır, icazə vermir ki, Azərbaycan vətəndaşları Şəhidlər Xiyabanına getsinlər. Demirlər ki, oradan yox, buradan gedin, qrup-qrup gedin, yanınızda koridor düzəldək gedin. Deyirlər ki, OLMAZ, VƏSSALAM! Bu gün bu videoda olanların bir neçəsi həbsdədir, sabah məhkəmələri olacaq. Məncə, bu addım artıq söz, ifadə, toplaşmaq və digər azadlıqlarda qırmızı xəttdir. Şəhidlər Xiyabanını ziyarətə də belə canfəşanlıqla qadağa qoyulması heç bir çərçivəyə sığımır. Buna görə də bütün siyasi partiyalar, vətəndaşlar, vətəndaş cəmiyyəti fəalları bu qadağanı pisləməli, həbs olunanların məhkəməsinə gəlməli, sonra qrup-qrup Şəhidlər Xiyabanını ziyarət etməlidirlər. Belə məsələlərdə geri çəkilmək onunla nəticələnəcək ki, sabah evdən 4 nəfər çıxanda "qrup şəklində çıxmaq olmaz" deyib, tutub basacaqlar içəri. Yuxarıda yazdığım kimi, bu görüntülərdəki ayıb Elmar Məmmədyarovun ana dilində danışa bilməməsindən böyük problemdir. Bunu da paylaşmaq, Şəhidlər Xiyabanına ziyarətə qoyulan polis qadağasını qınamaq lazımdır. Çünki, burada olanlar siyasi partiya üzvləri olsalar da, ziyarətləri siyasi aksiya deyildi, Milli Dirçəliş Günü münasibəti ilə şəhidləri ziyarət idi. Lamiya Adilgizi is a freelance Azerbaijani journalist.